Patricia Norvell: We are obviously in a very active period of expanding and redefining the boundaries of artistic activity. Jack Burnham has recently suggested that a the present a systems aesthetic is the major paradigm for the arts, and that we are in a transition from an object-oriented society to a systems-oriented society. [note 1] I'd like to find out what your artistic concerns are, and how they evolve, and whether you're at all concerned with objects or formal artistic issues. How do the aims of what you are doing demand how you present? Do they dictate your presentation and, if not, what choices do you have in the presentation? And then one of the main problems seems to be the documentation which you are very actively involved in. How do you handle that? PN: Mainly I want to know what your concerns are. How you came to them and how. . . ? DO: Well, the aspect of objects, an object-oriented art, I think, is being rigorously examined by young sculptors. I think due to the clarity and the success of some of the past sculptors--[Donald] Judd, [Robert] Morris, and [Carl] Andre--it became clear, or at least evident, that a point had been reached in a certain kind of work that couldn't really be extended. If much more time were to be spent on Minimal art, it would just be a redundancy, just a melee of recurring issues. So I felt this very strongly a few years ago and, ah, I felt in my own work a kind of an impasse with the manipulation of manual exertion over the media and the hindrance it seemed to have when placed inside of an exhibition hall. And all of these aspects I think are related and eventually were what overthrew the object, in a sense. [Pause]. Now the approaches other than object-oriented art are vast. You can examine them at this point in the new art--how sculptors are detouring from the preciosity of objects and the kind of thinking that's controlled by an object-oriented idea. My first attempt to work outside this range was very much in the bounds of a gravitation area. The part of an object that I wanted to get away with or from were static protrusions from the ground level. So to defeat that or work around that I dug a wedge inside of a mountain in Oakland. And this did two things. It first of all created an immobile, ephemeral, nonrigid form, but it also created a piece of sculpture that was bound to its location. And in that you're using a viable medi[um] of a living kind of tissue with the earth, what you find in the earth. You have to certainly focus upon the applications of this. But I think more importantly with that indentation or with that hole, there became the question of where exactly is the object. If that hole is an object or if a hole is an object, then is it the indentation or the peripheral? And by scribing into land, where does your piece leave off and where does it begin? So I think that was a very important, or is a very important, part about excavated forms. PN: Do you think any that's true of Michael Heizer's work? DO: Well, yeah. I think any hole made in the ground, especially an isolated excavation with a large area of land around it. . . Ah, I mean, is your piece a large area of land with a hole in it or is it a hole? Is your piece the entire globe with a hole in it? I'm sure it is. I think that's the only way to evaluate it. I mean, it seems reasonable. I know your focus can be twofold. There's the negative area, but there comes a point where the negative area ends and the terrain begins and extends. So it's all part of the media, ah, and even as you extend your peripheral or periphery onward into different zones and regions, it still applies. Another aspect of this art that I think is very influential to new sculptors is the fact that you are making something by taking away rather than adding. And this seems to have borne many fruits, pieces involving removals. PN: You mean pieces that are on a grander scale. Because sculpture used to be that way--with stone carving. DO: Well, yeah, there's been a lot said. What's more important, the finished Greek form of a residue of the chips, or the. . . Is the finished piece as good as the raw form from which it came? But I don't think artists have ever been concerned with removals or the residue of an act. And, although a lot of sculpture, a lot of technique, involved taking away, it wasn't concentrated upon, it wasn't focused upon as being a piece. I mean, like, I have ideas for pieces that involve merely sterilizing a surface, just a mere disinfecting of an area, as being the conceptual focus point. So this has never really been a concern in past terms. Although the process of, again, removing or eradicating has certainly been an elementary basic of sculpture. Recording Conceptual Art features a highly provocative series of previously unpublished interviews conducted in early 1969 with some of the most dynamic, daring, and innovative artists of the tumultuous 1960s. The nine individuals—eight artists and one art dealer—are now known as major contributors to Conceptual art. 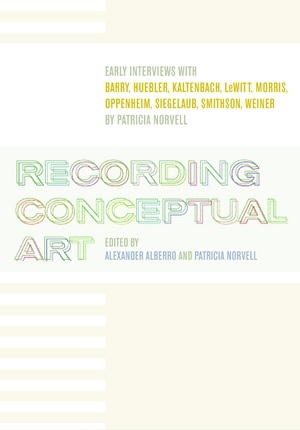 These fascinating dialogues, conducted by Patricia Norvell, provide tantalizing moments of spontaneous philosophizing and brilliant insights, as well as moments of unabashed self-importance, with highly imaginative and colorful individuals. Alexander Alberro is Assistant Professor of Modern Art at the University of Florida. He is coeditor of Conceptual Art: A Critical Anthology (1999) and editor of Two-Way Mirror Power: Selected Writings by Dan Graham on His Art (1999). Patricia Norvell is an artist living in New York City. Her work has appeared widely in public spaces and galleries across the United States. She has taught at Columbia University, Hunter College, and other institutions.